O podcast de hoje é sobre a expressão figure out. you know what? That’s my experience as well. In all these years having contact with English, I can tell you that “figure out” is probably one of the expressions I hear the most often. So this episode is dedicated to giving you examples of how to use figure out. I’m gonna go for the most common ways I know to use this expression, OK? OK. So just go ahead and think of something, some machine or piece of equipment that you tried to use. You tried, unsuccessfully. When you tried to get it to do what it was supposed to do, you weren’t able to. Maybe it was that juicer you saw on that infomercial on TV. You bought it, you paid a lot of money for it and now you’re trying to make some delicious juice at home. But things turn out to be way more complicated than you anticipated. And, you’re surprised! You know, the woman in the infomercial put a whole pineapple into the juicer and out of it came this clear, beautiful pineapple juice! You tried to do the same, but your juice looks like dirty water and your kitchen is a mess. There are pieces of pineapple all over the sink. Clearly, there’s something wrong here. 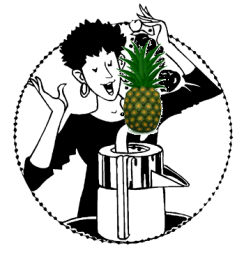 You’ve read the manual, you’ve rewatched the infomercial on YouTube, but it seems like you’re just not able to make decent pineapple juice. So you can’t figure out how to use this juicer. You can’t figure out how to make the juicer work. You could say “I can’t figure this juicer out”. I can’t figure it out. Slowly: I can’t… figure… it… out. I can’t figure it out. What does that mean? That means I can’t understand how it works, I don’t understand what I’m doing wrong, I’ve been trying different things to make it work for a while and nothing seems to work. I can’t figure it out! What’s your example of something you can’t figure out? There’s always something that other people have repeatedly explained to you, and you still can’t really understand. You get confused when you try to do it, it’s like it doesn’t even make sense! You can’t figure it out. What’s your example? And the interesting thing is, we can use this expression for people as well. Let’s say there’s someone in your office… a coworker. So one day this person will say hello to you and ask how your weekend was, and then the next day, he will just ignore you and it’s like you don’t even know each other. You can’t figure this guy out. You have no idea why he does that, what his motivations are… You can’t figure him out. Or, let’s say one of your teachers in school seems to think your answers to her questions in class are very intelligent, she says a lot of nice things about you, so you’re very confident you’re going to do well on the exams. But when you go check your grades, she has given you an F. And she says that your answers weren’t clear and that you need to learn how to express yourself. You can’t figure her out! What does she want? You’re the same person she was complimenting in class. You didn’t change your style. What happened? You can’t figure her out. And, of course, when someone has finally understood how to solve a problem, or how to make something work… They can say “I have figured it out!” I have finally figured this out. Now I understand how this works. Now I know what to do with it. I understand what it is for, and I know how to work it. I’ve figured it out. Here’s something very common in movies: one of the characters is going through some difficult times, there’s something going on in his life and he doesn’t know what to do, he’s feeling confused… And a friend says: “Don’t worry, we will figure something out”. We’ll figure something out. That means, we will find a solution, some solution. We will think of something. We’ll figure something out. You know, something. We’ll figure something out, or we will figure it out. We’ll figure it out – IT is the problem, right? It’s the difficult situation you’re talking about. We’ll figure it out. We’ll find a solution to this problem, we’ll figure out what to do. Alright, that’s it! Let us know what are the things you can’t figure out yet. And if you were thinking about saying “English”, go easy on yourself… It takes some time but you’re making progress without even realizing it. Talk to you next time. you know what? = quer saber? This day my wife is feeling sick and she doesn’t want to see a doctor. I can’t figure her out how she is being so stubborn. I’ ve never read anything so well explained, so clear to understand. Thanks so much!..Huggies! So…I can’t figure out how to learn all kinds of Phrasel verbs,some I’ve got them speaking or paying attention on movies,but others I really can’t figure them out!!! O loved your explanation. Thanks. very nice this website, to read and listen to the disciplines of English! very good! Hello there Ana Luiza, thanks for a lot of help, your podcast helps me so much!! keep doing this execelent action ! I can’t figure out the Relativity Theory! Can I say “I am figuring out the English language” ? See you later alligator! Oh, yep! “Figure out” is so commom in sitcoms and books. I’m reading “Dear John” and I noticed that “figure out” pops up lots of times. So, I can’t figure my boss out. He never lissen when we talk with him and always wanna things in him way. He is a difficult person to dealing with and I can’t figure him out the most of the time. I mean, he is a great manager and he did a lot of improves on the company but he doesn’t know how to deal with people. p.s. : Ana, please, if I wrote something wrong, could you tell me? Congrats again for your job here. I love your podcasts. Thank you for the podcast. Very usefull ! You’re completely right. I love watching sitcoms and “figure out” is an expression that they use a lot. Talking about sitcoms. I’ve watched “The Big Bang Theory” and It’s so funny, but I’m tring to figure Penny out, because sometimes she seems that likes Leonard and other time she shows up with a new boyfriend. But no problem, I’ll keep watching and I’m sure I’ll figure her out. Gostaria apenas de expressar meus agradecimentos em bom portugues mesmo,pois tenho aprendido muito com seus Podcasts. Faço download de um por um, e tenho um pen drive cheinho deles. Junto com os Podcasts do Dr Jeff Mquilan, hoje ja consigo falar e entender 90 % do que ouço. Detalhe : Comecei mesmo estudar inglês há seis meses apenas e nunca frequentei escolas ou cursos de inglês. Parabéns Aninha, e obrigado por deixar a nossa disposição todo o seu conhecimento. Caso leia esse comentário e quiser me responder, poderia faze-lo no meu e-mail ? Previous Post Inglês com Cartoons #65: 3 for the price of 1 Next Post Como eu uso FOR e WHILE?